Are you the first generation of your family to go to college? The proportion of first-generation students in college is growing, as the children of immigrants and working-class families realize that college is the key to middle-class stability and social mobility. According to the New York Times, because the 2008 recession hit middle-class and blue-collar families so hard, the education gap between the wealthiest and the rest of us is bad and getting worse. A college education, professional employment, and financial stability is the American dream, but without money, it’s just a dream. First-generation student struggle – the struggle is real. Besides the challenges of a college course schedule, most first-generation students are at an economic disadvantage. According to the Higher Education Research Institute, median family income for freshmen whose parents graduated from college is over $99,000; for first-generation students, it’s less than $40,000. That gap makes a big difference when it comes to paying tuition, fees, books, food, and living expenses for first-generation students. First-generation students are much more likely to need to work in addition to going to school, more likely to need loans, and more likely to take out less-than-fair private loans to make ends meet. 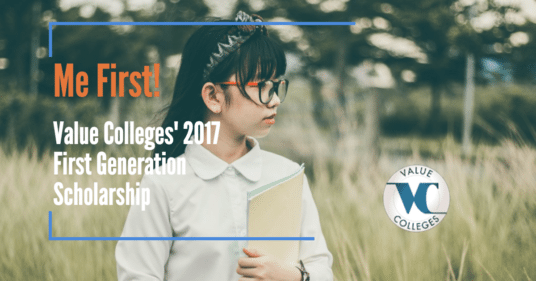 VC is proud to provide a one-time Scholarship in the amount of $1000 to offset the price of tuition for candidates who qualify as a first-generation college students. We want to encourage first-generation students to excel in their program, complete their degree, and pass on to future generations the possibilities of attaining degrees in higher education. Be a first-generation college student in your immediate family. Be legal residents of one of the fifty (50) United States of America or the District of Columbia (D.C.), verified by legal documentation. Be currently enrolled in an accredited post-secondary institution of higher education or planning to for 2017-18 school year. Complete and submit the Online Value Colleges Application Form, Online Essay (see question below) and email transcripts/recommendation to our editor. Applicants must consent to provide first and last name and a quote for display at ValueColleges.com if notified as a winner of the 2017 Me First! Scholarship and adhere to our Terms & Conditions. First, complete the Online Application with your basic information (Name, School, Contact). Our question to you is simple: Why Me? There are more first-generation college students than there have been in decades; what differentiates you from everyone else? Tell us what aspects of you or your family have made it possible for you to take that next step forward and be the first person in your family to go to college. 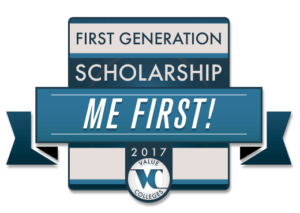 Value Colleges will accept applications and essays for the 2017 Me First! Scholarship between now and the 15th of June, 2017. All submissions must be in by 11:59 p.m. (Eastern Standard Time) June 15, 2017. The scholarship committee at VC will review all essays and after a final decision will be made, recipient will be notified by email or phone on or around August 1, 2017. Shortly after, a letter and check (made payable to the award winner) will be issued in the amount of $1000.